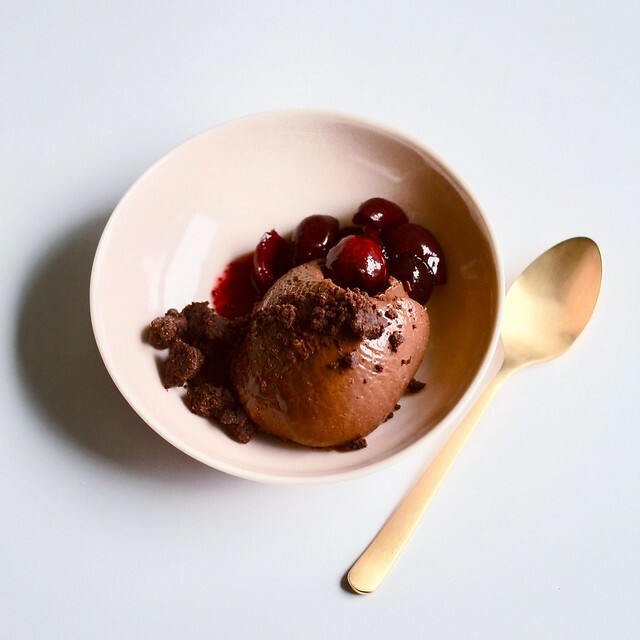 If Cold Chocolate Crémeux, Wine-Poached Cherries and Lots of Crumbs sounds pretty cheffy, that’s because it’s inspired by a dessert Dorie had a bistro in Paris. A crémeux is essentially a custard that’s thickened with gelatin. It’s not hard to make and sets up dense and rich, especially when it also has a lot of good dark chocolate blended in! The crumbs are cocoa-flavored streusel bits, and wine-poached cherries are just what they sound like…I used an Aussie shiraz in my poaching liquid. Serve this dessert in a cute little bowl…you’ll have a combination of textures and sweetness levels. Like most desserts with multiple components, it helps when you can get some of them out of the way ahead of time. The cherries can be poached well in advance and kept jarred in the fridge. The cocoa crumbs, too, but I’d keep them in the freezer for longer-term storage. Any extra cherries and crumbs you may find yourself with will be good toppings for an ice cream sundae later…just sayin’. Yes, this was good but ever so rich. Looks so elegant! I love this flavour combination. It’s good to know it can be done on stages. This dish looks so gorgeous. The perfectly round crémeux, the bright red cherries and just the right amount of crumbs on the plate. Well done!